– graduate of the Faculty of Law at Charles University in Prague (1996). 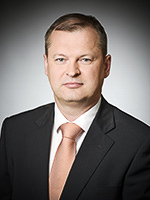 He began his legal career in tax administration, continued in a foreign law firm where he, in particular, represented foreign clients before courts in the Czech Republic. He subsequently took a break from private practice and worked in the business sphere for four years, returning in 2003. In our law firm he focuses on consultation in the fields of property, construction law, greenfield investments and administrative law. He represents clients in legal proceedings.